In case of agency closing due to inclement weather, The Breathing Association will post our closing on NBC4 news, and our voicemail message will indicate the office is closed for business. The Breathing Association is in northwest Columbus near Henderson Road and Route 315. From South 315, take the Henderson Road exit, turn west, go to the stop light at Kenny Road and turn left (south). At the next light, turn right (west) onto Old Henderson. The Breathing Association is on the right side at 1520 Old Henderson Road. The main entrance is located at the east end of the building. Wheelchair access is available at this entrance. Please use the entrance at the west end for The Lung Health Clinic and HEAP. 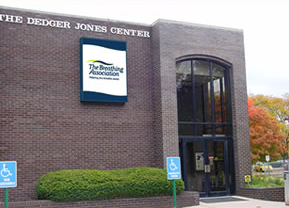 In 1987, The Breathing Association completed the purchase of the building through a generous donation from Mr. Dedger Jones. The building is named the Dedger Jones Center in his honor. Monday – Friday 7 am – 5 pm. East location Monday hours are 8 am – 5pm. By appointment only except from 8:30 am – 10 am when walk-ins are accepted. Click here for the Mobile Medical Unit schedule. Off of S. Hamilton Rd. Off of W. Broad St.